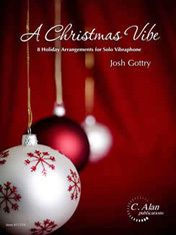 A Christmas Vibe was written to provide recognizable but unique arrangements of familiar Christmas tunes for 4-mallet solo vibraphone. Each of these titles varies in style, but all are intended to be appropriate for any Christmas performance venue – sacred or secular. Included in this collection are arrangements of O Come, O Come Emmanuel, O Little Town of Bethlehem, It Came Upon a Midnight Clear, I Heard the Bells on Christmas Day, Away in a Manger, Good Christian Men Rejoice, God Rest Ye Merry Gentlemen, and Pat-a-pan. These arrangements all fit on a standard 3.0 octave vibraphone.